Wild West EV – Power Up Your Electric Pony on the Range! You can help Wild West EV add more stations sooner! 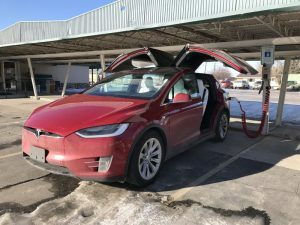 Our first charging station is now open and operating at the Breadboard restaurant in Lander Wyoming. The charging station is capable of the fastest level 2 AC charging specification of 80 AMPs. This charger can be used on any modern Electric Car on the market. Depending on the type of vehicle the charging speed can very. You can add 50 to 60 miles of range per hour on a Tesla with a dual or high amperage onboard charger. Our Electric Vehicle Charging Stations will also work on the BMW i3 and i8, Chevy Bolt, Nissan Leaf and with plug in Hybrids like the Prius Prime or Chevy Volt. With the J1772 industry standard plug, they are very safe to use in all weather conditions. The high power is only sent after payment, and being plugged in. Then the Vehicle and our Station do quick automatic safety checks before supplying the high volt and amperage to start charging the car. The Vehicle will take as much power as the onboard AC to DC charger can handle. In our testing with a 2012 Chevy Volt it only used 14 amps of the 80 amps available. Swipe any major credit card to activate the station before plugging in J1772 plug in the Vehicle. Your card will authorize and when the timer starts you may plug in your Vehicle. Charging will start and you will be billed at $0.08 per minute until the “End” button is press on the charging station or maximum of $20 per swipe is reached. As your Vehicle is charging you can eat at The Breadboard and/or go the Museum, bowling or near by shopping. Driving around Wyoming in an electric car can be difficult when leaving your home charger. Here area few website that can help in finding public charging options.